Who doesn’t love old favorites dressed up in fresh new ways? No one! That’s why it’s such a treat to host B.J. Lee today in celebration of her picture book, There Was an Old Gator Who Swallowed a Moth (Pelican Press), illustrated by David Opie. This romp of a story is even made funnier by the lively illustrations. And you won’t believe all the work behind this fictional tale. Read on! 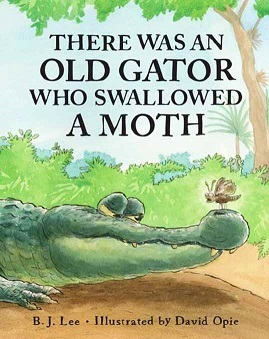 For this fictional picture book – There Was an Old Gator Who Swallowed a Moth – I did a surprising amount of research. Because it is an There Was an Old…parody, there definitely had to be a whole lot of swallowing going on. 🙂 What would the gator swallow? 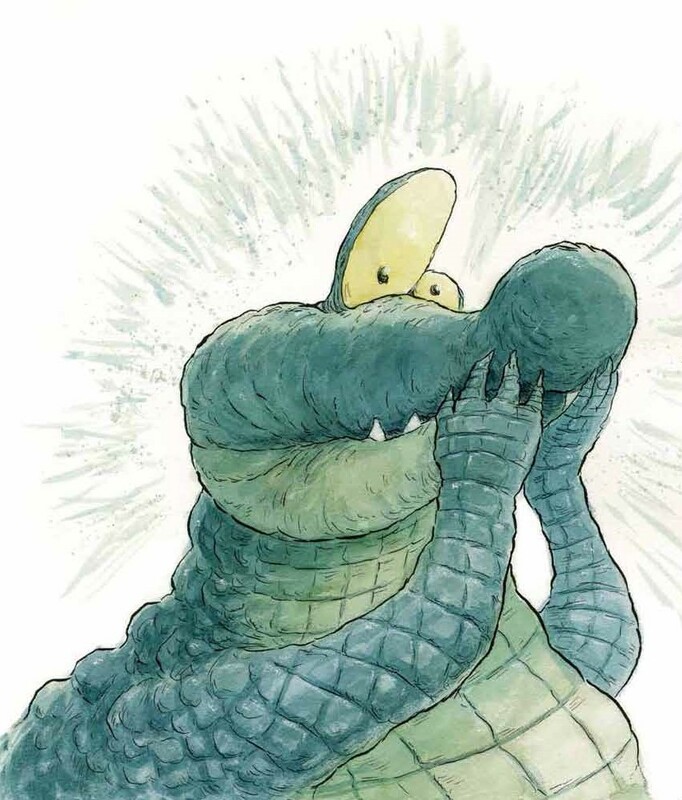 Since alligators/crocs are universal characters in picture books, I could really have him swallowing anything. But I wanted Gator to be lord of his actual habitat. First nonfiction point? Alligator’s habitat. Everyone knows there are gators in Florida and Louisiana, but what I was surprised to learn was that gators also reside in southern parts of Georgia, Alabama and Mississippi; the coastal Carolinas; East Texas; the southeast corner of Oklahoma; and the southern tip of Arkansas. Their preferred habitat is swamps and bayous. Secondly, I needed a hierarchy of animals for him to swallow. I set about studying animals of the Florida bayou. I also needed to find animals of different sizes that would make sense in a swallowing hierarchy. A crab would not swallow a panther, for example. I wrote a first draft using animals of the bayou. But I found that some of these creatures were lackluster and had less than stellar rhymes. For example: There was an old gator who swallowed a skeeter. What could be sweeter than a nice juicy skeeter? While this is a fairly good rhyme, I didn’t like it because it implied Gator was eating the skeeter. I only wanted Gator to be swallowing, not eating. Because my animals-of-the-bayou rhymes were not entirely working, I decided to include all Florida animals. After all, this isn’t nonfiction. It’s a fictional romp set in a Florida swamp. I included well-known Florida animals such as the shark, panther and manatee. With these animals I could get kid appeal, good rhymes, and punch, particularly since the Florida panther is endangered and the manatee threatened. While the fiction writer has to take into consideration nonfictional aspects involving setting, they also have to do what’s right for the story and not be slave to their nonfiction research. After this book was accepted for publication, I was asked if I wanted to give any notes to the illustrator. All of my nonfiction research flooded my brain and I thought about passing it along to the illustrator. But then I thought, no. Though my decisions in this book were informed by nonfiction, in the end the book is a work of fiction and I made the decision to brighten the book by including animals with kid appeal that, though associated with Florida, did not necessarily live in the bayou. I didn’t want to dictate to the illustrator that he should use this or that moth indigenous to Florida. I wanted him to simply be inspired by the words. I had done my work. Now I would let him do his. 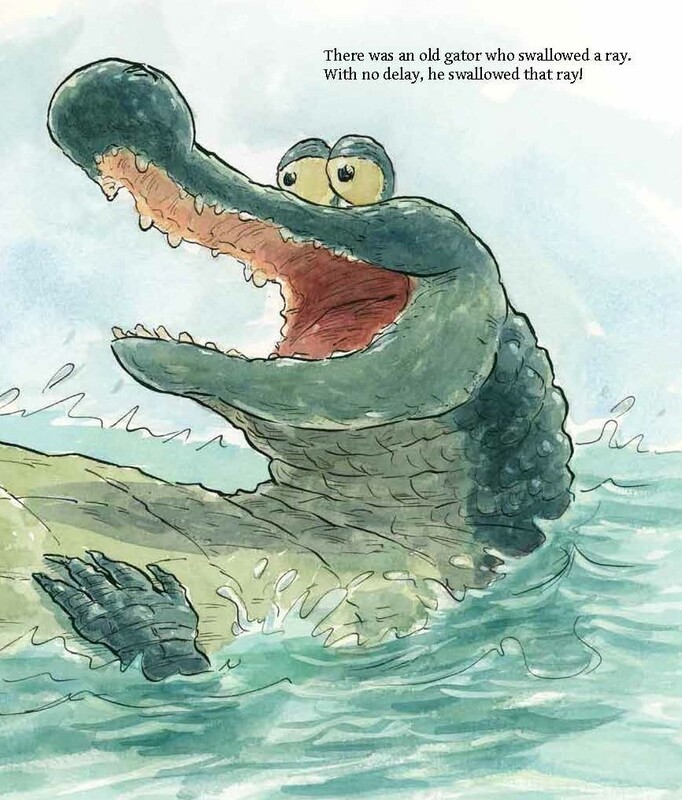 This decision was wise because David Opie did a splendiferous job of envisioning Old Gator as well as the other characters in this fictional picture book informed by nonfiction. B.J. Lee is a former college music librarian turned full-time writer and poet. 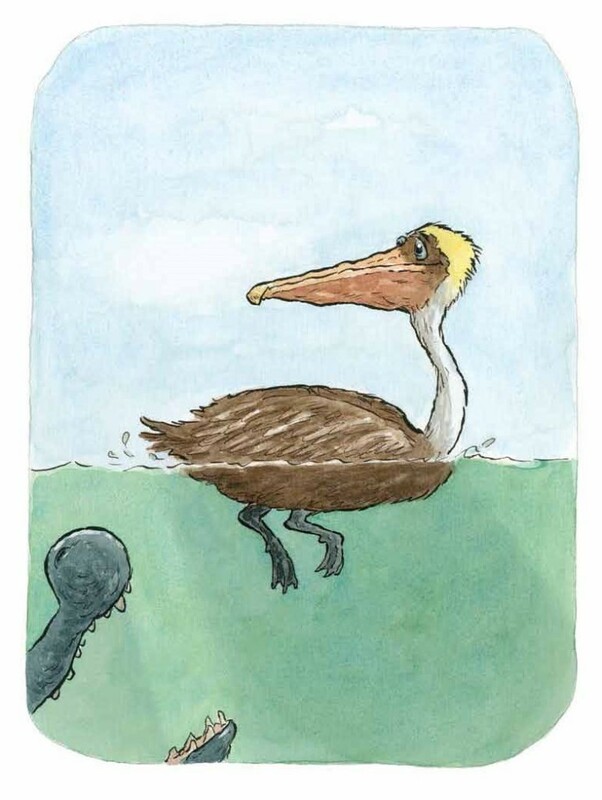 Her debut picture book, There Was an Old Gator Who Swallowed a Moth, released January 28, 2019 from Pelican Publishing. 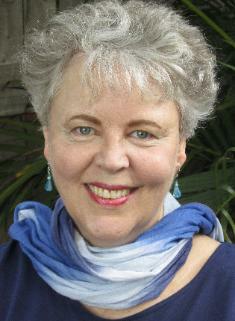 She is an award-winning children’s poet with over 100 poems and stories published/forthcoming. She has written poems for children’s anthologists Lee Bennett Hopkins, J. Patrick Lewis, Kenn Nesbitt and others and appears in anthologies by such publishers as Bloomsbury, National Geographic, Little, Brown, Wordsong, and Chicken Soup for the Soul. In adult poetry, she has been nominated for The Rhysling Award six times. Magazine credits include Spider, Highlights, and The School Magazine. She blogs at Today’s Little Ditty, where she is an authority on poetic forms. She lives in Florida with her husband, poet Malcolm Deeley and toy poodle, Bijoux. For more information you can reach her on her website, Facebook or Twitter.